The online retail landscape is growing at an astonishing pace. Statista emphasizes that global e-commerce sales will reach $4.88 trillion by 2021. For your customers, the rise of the e-commerce ecosystem means a broader array of products and greater purchasing opportunities. On the other hand, for you as an e-commerce business, this means fiercer competition and poorer opportunities to stand out. Given these facts, it’s evident that having a solid digital marketing strategy in place is not optional anymore. It is a necessity for any online retail business that wants to stay competitive. Now, your goal is to choose those online promotion channels your potential customers use. As the majority of online customers are on social networks, it’s not surprising that 90% of companies will be using some form of social media marketing for customer service by 2020. These channels give you the opportunity to humanize your brand, build stronger customer relationships, and rise above your competitors. In this article, we will unveil a few effective social media promotion tactics that will take your e-commerce marketing to the next level. The main point of social media marketing is to engage your customers, intrigue them, and inspire them to visit your e-commerce site. However, driving website traffic from these channels is only half the job done. The other half is converting these visits into leads and, ultimately, sales. Conversions are, after all, what keeps your e-commerce site alive. But, how to inspire a customer to buy from you without sounding too intrusive? This is where content marketing steps in. According to some recent statistics, sites with a strong content marketing strategy in place have conversion rates 6 times higher than sites that don’t blog at all. And, this is logical. Creating authoritative content supported by relevant data and real-life examples build trust among your potential customers. Seeing that you know what you’re talking about and that you’re helping them solve specific problems, your target audience will be more eager to buy from you. Above all, this is an excellent opportunity to create personal relationships with your customers and make your brand more approachable to them. To get a customer to choose you over your competitors, you need to give them a reason to buy from you. They want to hear your story, so this is a high starting point. Tell them how you built your e-commerce business and provide behind-the-scenes photos of your business processes or employees. Implementing storytelling and personal stories into your content increase transparency and emphasize your uniqueness in the sea of your competitors. A customer wants to know what your product is about and how it meets their demands. Precisely because of that, you need to provide in-depth information about how they can choose your product, use it, or assemble it. The guides you create shouldn’t be focused on selling a product. Instead, they need to educate your customer and prove you care about helping them find the right solution to their problems faster. This is precisely what BestBuy does with their Buying Guides. Namely, they guide a user through a tutorial and provide them with all the details they need to buy a product effortlessly. 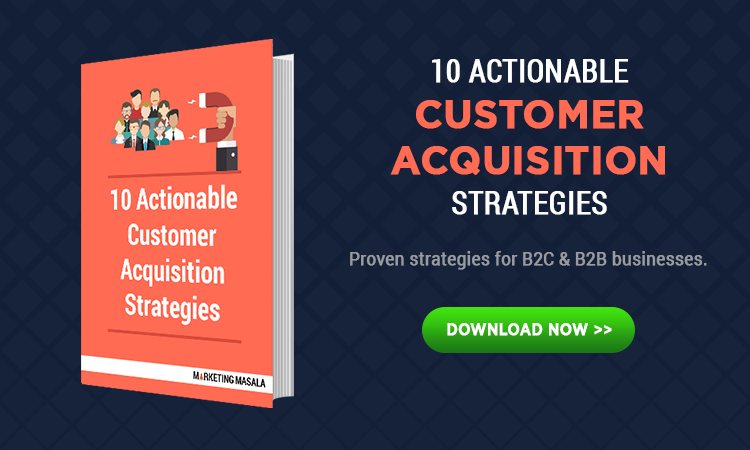 This screenshot also shows that their CTAs are implemented naturally throughout a guide to address customers in different stages of a buyer journey. Always include visuals in your guides. You could create a short explainer video or an infographic. For example, if you’re selling clothes online, a size chart will be super-helpful for your customers. And the example of Lane Bryant backs me up on that. Namely, the brand adds videos to product descriptions to show how their clothes look in real life. This is the type of information every customer wants to know before buying from you. Prove the effectiveness of your products. If your product works, you need to prove that. This is why you need to start writing great case studies that emphasize how your products helped your customer. 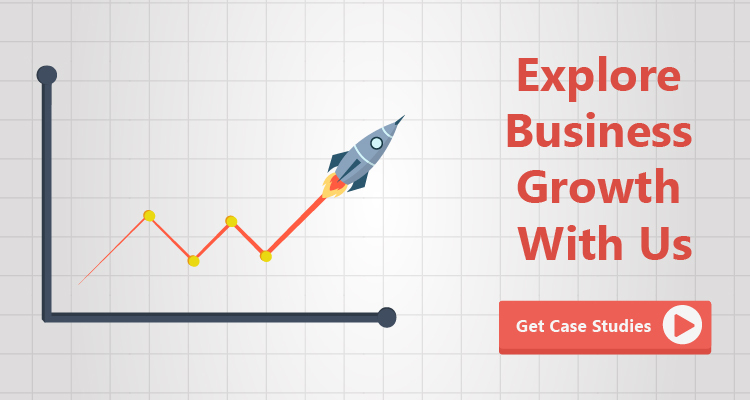 Case studies are an excellent opportunity to convince people with similar problems to try out your products. And, the stats prove case studies. According to the 2014 B2B Technology Content Survey Report, white papers are the first most influential content form in the buying process, while case studies are in the third place. Just with like the guides as mentioned earlier, your case studies need to focus on your customers’ needs, not your product. Put the spotlight on the challenges they’ve been facing and the problems they’re trying to solve. Then, emphasize how their customer journey changed and what tactics, products, and services they used before and why these efforts were in vain. Logically, the next step is to show how they discovered your product and how they implemented it. Finally, you need to focus on the results they achieved using your product. In the past, you could get away with opening a few social media accounts for your business and publish content randomly. Today, this is not possible. Your customers want to see highly relevant content that brings them value. Therefore, to get the most out of your social media marketing strategy, you need to tie the social network to the content that resonates with its target audience. Facebook: Interactive content like quizzes, educational videos, live videos, heartwarming customer stories, relevant curated content. Instagram: High-quality photos of your products, stories, quotes, behind-the-scenes photos of your staff. Twitter: New blog posts and hottest industry news. Pinterest: Comprehensive visual guides and info-graphics. Of course, you don’t have to waste your time and energy on those platforms or forms of content that don’t work for you. For starters, it’s enough to choose only one platform and focus on promoting your e-commerce business on it. Now, organic social media traffic is incredibly valuable to your social media strategy. Unfortunately, it doesn’t always deliver the desired results. With your growing competition and numerous social media updates that prioritize user experience over brand promotions, putting yourself in front of the right customers is now more difficult than ever. Precisely because of that, observing social media as a completely free channel for your e-commerce brand to grow is a big mistake. To target the right customers, increase conversions, and boost the overall exposure of your brand, you need to combine organic search media with paid advertising. Optimize your landing pages to reduce shopping cart abandonment, as this is where conversions happen. If your landing page is not related to your ad or it is poorly optimized, a user will leave it without taking the desired action. Choose the right form of ads. 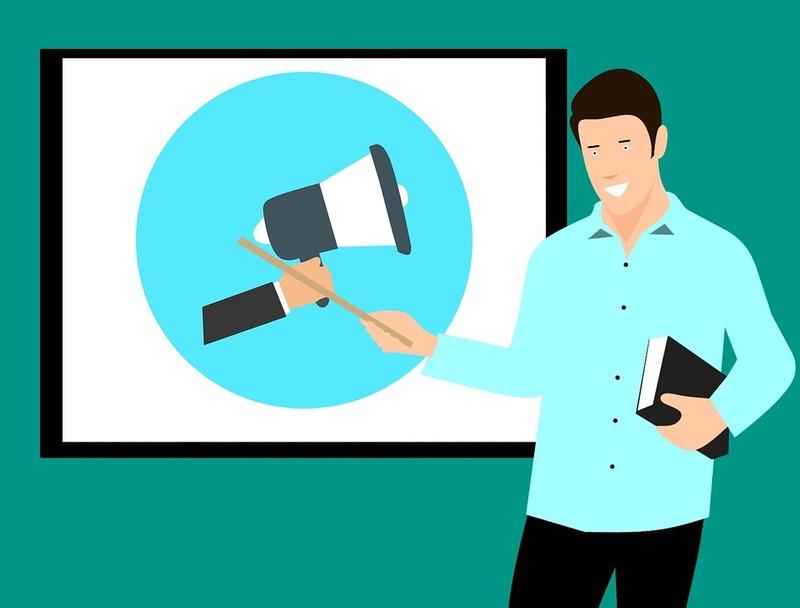 For example, Facebook ads in a form of banners and increase sales, while videos are great for boosting brand awareness. Timing is crucial when it comes to both paid and organic search. This is why you need to analyze your social media content performance and see when your customers interact with it best. With tools like Facebook’s Ad Scheduling Optimization, you will be able to optimize your ads and display them only when your audiences are online. Use advanced targeting options. By casting your net too wide, you may end up addressing irrelevant leads and wasting money on them. Precisely because of that, your goal is to target your audiences narrowly. By combining your organic and paid traffic data, you will be able to segment your audiences more effectively and create reliable buyer personas. This will give you a better audience view and help you make the most out of advanced targeting options PPC offers. Don’t let your non-buyers escape. There are numerous reasons why your customers didn’t complete the purchase. Now, in the past, it was difficult for online retailers to get back to these customers and win them over. But now with Facebook’s retargeting features, you can create custom retargeting ads, provide offers specific to prospects’ individual needs, and convert them into customers. A/B test every aspect of your ad, from your titles and headlines to ad placement and images. Research says that, as customers, we’re more likely to trust family and friends’ recommendations than content promotions. Similarly, when buying online, we trust online reviews and content shared by “average customers” more than the self-serving, branded content. This is the main idea behind promoting user-generated content on social media. User-generated content (UGC) allows you to create brand ambassadors that promote your e-commerce business for you. Among other things, peer-to-peer promotion drives engagement and influences potential customers to buy your products. One of the easiest ways to encourage UGC is to incentivize your customers. This is precisely what big brands like Coca-Cola or Starbucks do. All you need to do is throw a giveaway and offer your luxury products as rewards. And, to enter the competition, a customer first needs to publish a creative photo or video of your product and use your dedicated hashtag. Makes sense, right? A few years ago, Coca-Cola launched the “Coke Games” campaign during the Winter Olympics. The rules were quite simple- users needed to publish the videos of themselves playing games like Coke Hurling on the brand’s Facebook wall and they’d automatically enter the competition. Now, one of the best channels to drive UGC is Instagram. Because it relies on visual content (images and Stories), users find it easier to post branded content. In turn, it allows you to repost and share UGC to maximize your brand appeal and generate even more traffic through hashtags. And, the campaign done by Wayfair, an online furniture store, proves that. 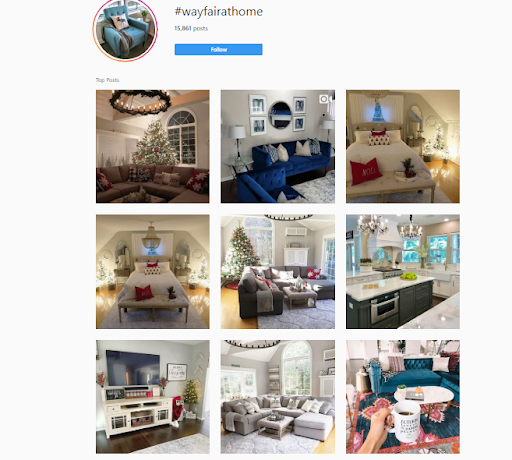 Namely, their customers can post their interior design featuring the Wayfair furniture, using the hashtag #WayfairAtHome. The brand then reposts their content and gives the links to the products in the picture. This strategy provides social proof and design inspiration and, at the same time, motivates users to click on the link and buy the same products. Social sharing buttons have become a must-have on websites and blogs. Whether it’s on your website’s product pages, or your Amazon or Shopify accounts, adding them to your all your storefronts is only the logical next step. The obvious benefit of adding social share icons is that it allows you to quickly share product pages to your social channels. But what you might not be aware of is that these buttons also work to maximize brand exposure and reach, improve customer experience, add new UGC capabilities, and even benefit your e-commerce SEO by increasing organic traffic to your site. Mind the location. Readers usually skim posts and even share them before they finish reading them. So, don’t make them scroll endlessly to find your social share buttons. Most importantly, make them easily visible by putting them in a decluttered area with lots of white space. 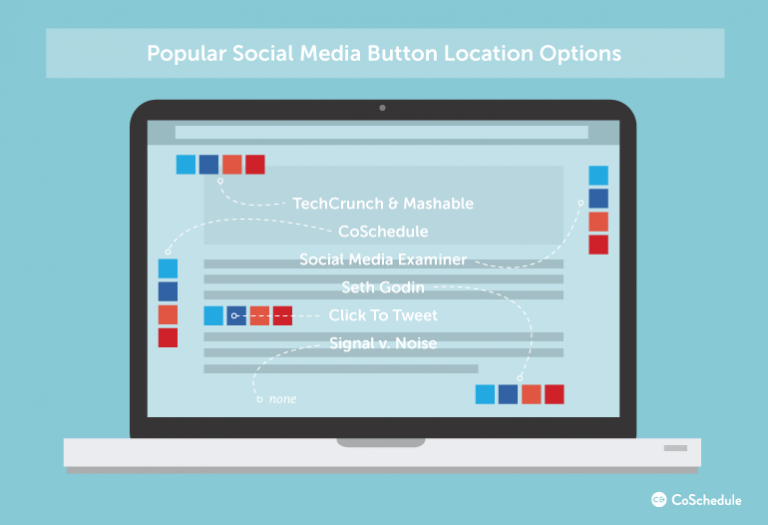 This photo by CoSchedule explains perfectly what the best positions for a social share button are. Choose and organize your social share buttons properly. Adding lots of buttons creates clutter on your site and harms the overall user experience. Also, a user may have a hard time determining which button to click on and may leave your page without sharing it. Display share counts only if your engagement rates are high. Adding buttons for platforms your audience doesn’t use or having low share count, in general, may result in negative social proof and discourage people from sharing your posts. Pinterest is one of the most significant platforms for e-commerce businesses. For example, did you know that 55% of online shoppers highlight it as their favorite platform for finding products and making purchases? 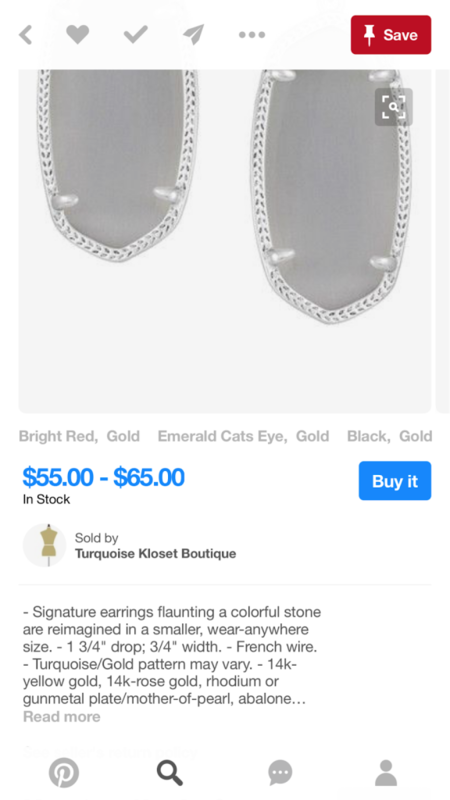 And, one of the main reasons for that its Pinterest’s Product Pins (previously known as Buyable Pins) that users to buy products directly as they come across them. Using this option, you allow a user to buy your products directly from the Pinterest platform, without having to leave it. A customer just needs to enter their credit card information and they will be able to complete the purchase in just a few clicks. Apart from making the checkout process more comfortable, this option will also boost user experience and your conversion rates. This is precisely what Neil Patel claims in one of his posts, giving an example of Daily Chick, a women’s clothing retailer that increased their sales by 30% right after integrating Buyable Pins. Another way to allow direct shopping on social media is to set up a Facebook Store. Add your top-selling products and link them directly to the checkout page on your website. This feature allows you to leverage page visits on Facebook for maximum conversion, as you can create a carousel ad that directly promotes products at the top of your feed. Social media is here to stay. It’s a big part of your customers’ daily experience, and your brand needs to be present on social media if it’s to tap into that potential and make more sales. So, take the first step and create a plan of action, and start driving engagement and traffic through your promotion. After that, it’s all about fine-tuning the system and watching your profit margin sore through the roof. Find this interesting? Talk to us to learn more!